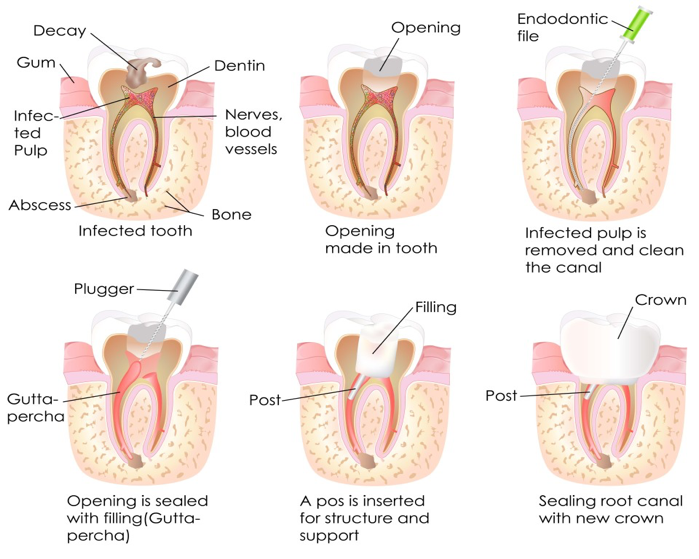 A root canal is required when a tooth is decaying internally and requires the dentist to drill into the tooth, extract the pulp prior to refilling and capping the tooth to prevent future decay. Your teeth are made of a hard material called dentine that is covered in a protective enamel. The interior is made of a sensitive tissue called pulp, which provides oxygen and nutrients to the tooth. Once a tooth is fully formed, nutrients for the tooth come from the tissue surrounding the root and the tooth can function without its pulp. If the pulp becomes diseased or injured, through poor dental hygiene, fractured tooth, teeth grinding or other illness, the pulp is removed to avoid further decay and to save the tooth. During the procedure the dentist will clean and shape the root canals leading from the root of the teeth to the interior pulp. The interior is then cleaned, dried and packed with a filling. A crown or cap is then applied to the top of the tooth to seal the hole and create an artificial biting surface. This process is called a root canal treatment. The pain from root canal injury will not heal by itself. If left unattended it will deteriorate, causing worse pain as it progresses. The infection will spread, bone around the tooth will begin to degenerate and the tooth may fall out.